Dashboards are cool additions into marketing automation. Marketers and sales reps are increasingly relying on data visualization and graphics to understand how their efforts fructify in the long run. As machine learning and artificial intelligence take the center stage of innovation in martech, visual analytics with predictive intelligence seems to be growing into the biggest investment market in the US. MapD Technologies Inc. handsomely proved today how investors are willing to fund innovation in visual analytics. 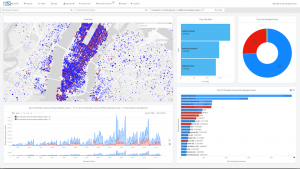 MapD, the world’s fastest and most powerful data exploration platform, announced today that it has closed a $25 Million Series B funding from four investors, led by New Enterprise Associates (NEA). Nvidia is both hardware partner and investor and has been closely involved with the company since they won their $100K Early Stage Challenge Award in 2014. The latest funding will enable the data science company to penetrate deeper into analytics and expand its enterprise product suite. The financing comes amid a rapid increase in the adoption of ultrafast graphics processing units (GPUs) to power enterprise applications including machine learning, numerical computation and now data analytics. Though a startup, this San Francisco, California-based business intelligence platform has a promising future in the visual analytics ecosystem, especially in Business Intelligence reporting within martech. For instance, MapD offers a limitless opportunity to business by providing a scalable platform for fully interactive data exploration. The speed and scope of MapD’s solutions enable organizations to compete more effectively, to solve more complex problems and to manage operational risk more comprehensively. For sales reps on the field, MapD could be a savior technology. By leveraging Geographic Information Science (GIS) provided by MapD, sales reps can derive powerful insights from spatial and non-spatial data at relentless pace and accuracy. Combine the power of People-based marketing and Location Analytics to this, and Voila! Marketers can know every aspect of how and where customers want to engage with brands that mean to them. 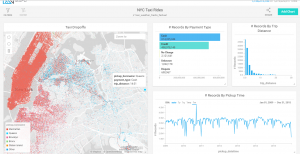 The $25 million Series B funding for a data exploration startup is big news, though it was expected to happen in 2017. It was just a matter of when it would happen! 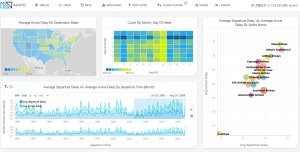 In December 2016, MapD rolled out a new database and visualization features for enhanced analytics. In April 2016, Gartner recognized the startup as a Cool Vendor in DBMS category, which also included companies like BlobCity, Blue Talon, Cazena, and Ryft. Earlier in April 2016, MapD secured $10 Million Series B from Vanedge Capital, Verizon Ventures, and Nvidia, joining earlier investor GV (formerly Google Venture).